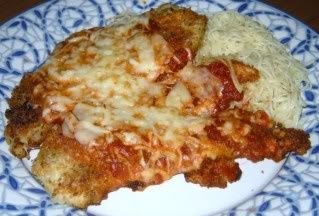 We'll have to call mine "Sort of" Oven Fried Chicken Parmesan. Since I picked up thin cut boneless breasts by mistake, my chicken was mostly cooked in the pan, and then finished under the broiler to melt the cheese. I love the crispiness of the chicken, big fan of Panko here. Would definitely make this again, and I would stick to the thinner chicken breasts. The picture is of Tim's plate, who tolerates me making "light" recipes because this is his main meal and he eats 2x the serving size.